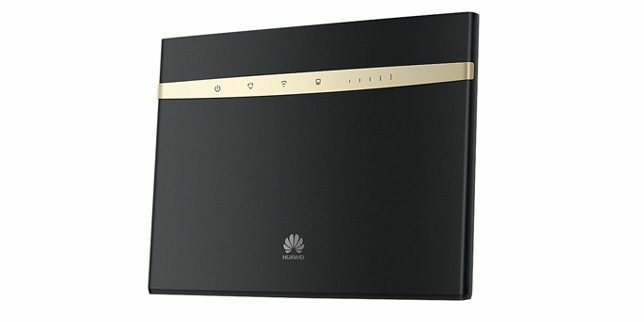 Huawei has released a new Cat 6 LTE router named B525 which is sold in two variants B525s-23a and B525s-65a. It supports LTE FDD / TDD / DC-HSPA+ / UMTS / EDGE / GPRS / GSM networks and is now being sold in most of the countries in locked form. 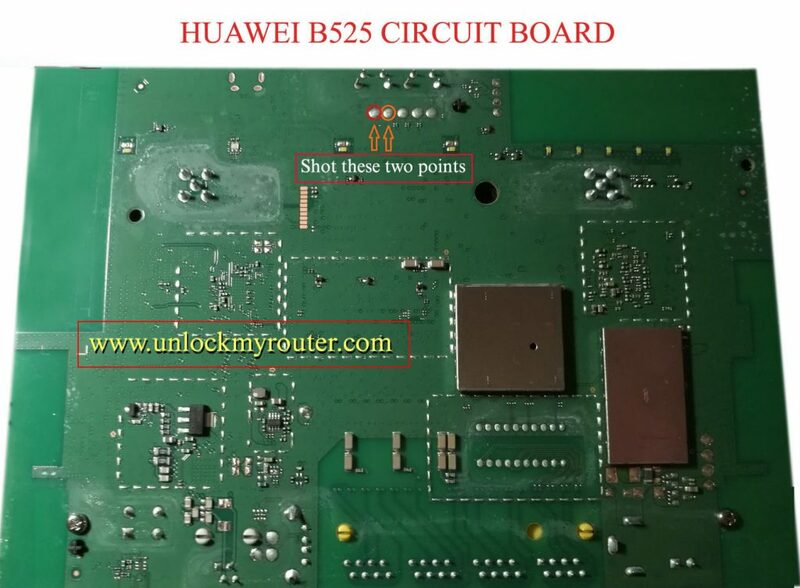 Our team has got success in unlocking B525 router so that it can be used with any sim in any part of the country worldwide. Note: You will have to unscrew the router and a good quality male-to-male USB cable is also needed to proceed with the unlock process. Using the tweezer or wire, shot the points marked (circled) in the above picture. Now, without releasing, insert power-cable. 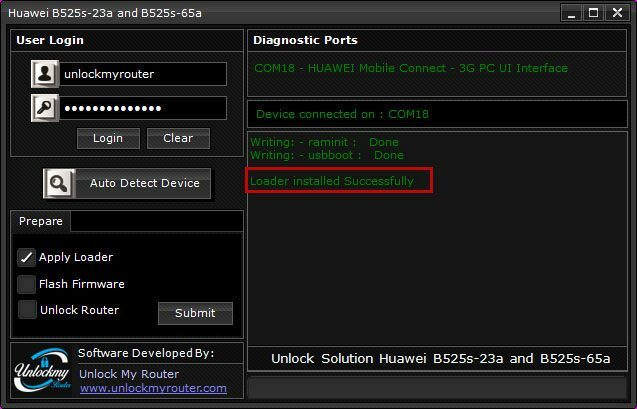 Important Note: B525 router should remain switched OFF after inserting the power-cable. If the router turns ON after inserting it, you will have to repeat the shot process again. After a successful shot, insert the USB cable. 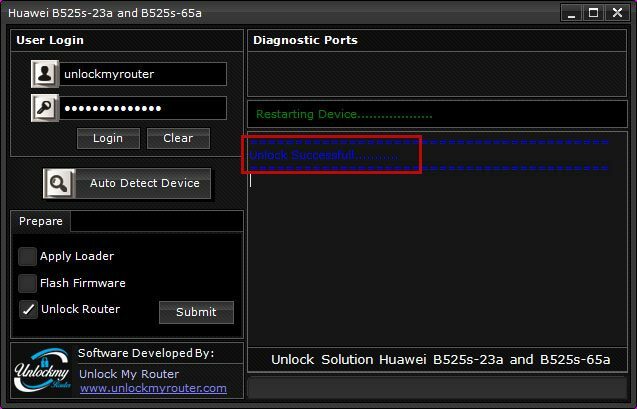 Open Device manager and you should see a new com port as shown in the pic below. 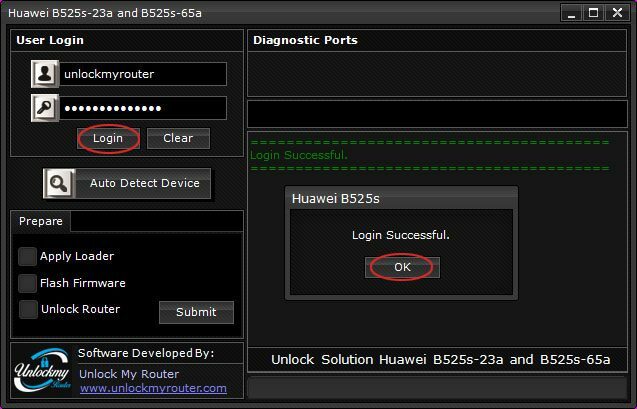 If the port is generated, proceed to phase I.
Download B525s-23a Unlock App. Extract it using WinRar or any other utility and open it. Click the login button (username and password is unlockmyrouter). After the Login, Click Submit button after selecting Apply Loader option. The unlocking app will ask you to enter the bootloader code. 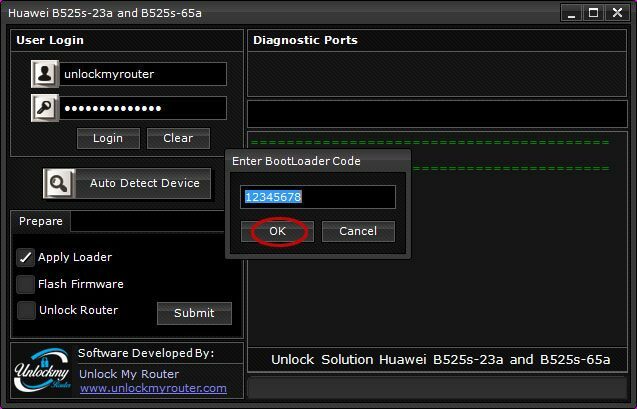 Copy and paste the bootloader code which you have received via email after the payment and click OK button. Loader installation will begin, wait for it to finish. Once the loader is installed, you will see the message “Loader Installed Successfully”. Wait for around 1-2 minutes and check the Device Manager again. It should now show two com ports as given in the picture below. If your computer is showing something else in place of ports then you might be missing drivers. 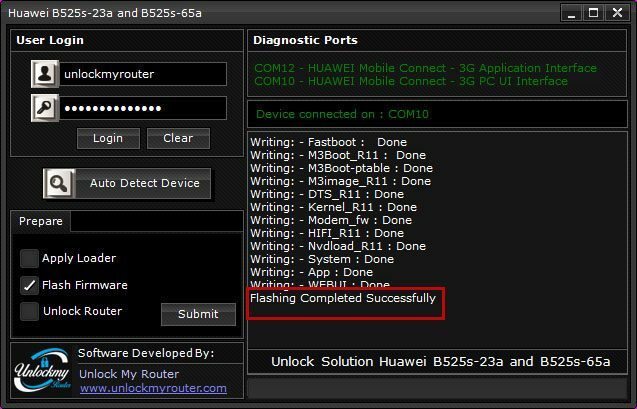 If the previous step is successful, select Flash Firmware option and click submit. Within a few seconds, the firmware installation process will begin and you will be able to see the progress in the unlocking app. Don’t interrupt the process and wait for the installation to complete. It generally takes around 10 minutes and may vary depending on your PC configuration. 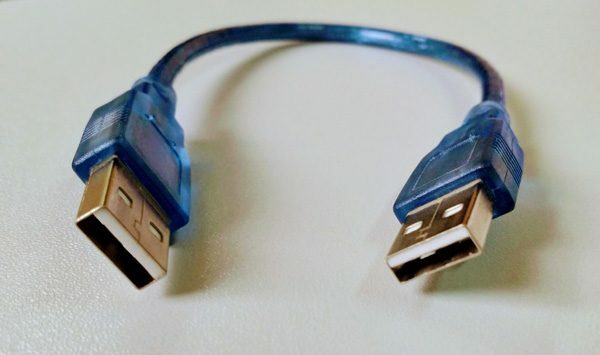 Wait for another two minutes, disconnect both the cables (power and USB). Insert any SIM card and switch ON the router. Connect the router to the computer using LAN cable and wait for it to load completely. Select unlock option and press submit. Enter the unlock code received and click the OK button. Your router should restart automatically to apply the new settings. If it is not restarted, unlock it again by repeating the previous step.